Preheat griddle or skillet. Cook bacon until crispy and drain on paper towels. Prepare pancake batter by mixing Bisquick™ mix, milk, and eggs in a medium bowl. Place bacon strips on griddle or skillet, leaving plenty of room in between them. 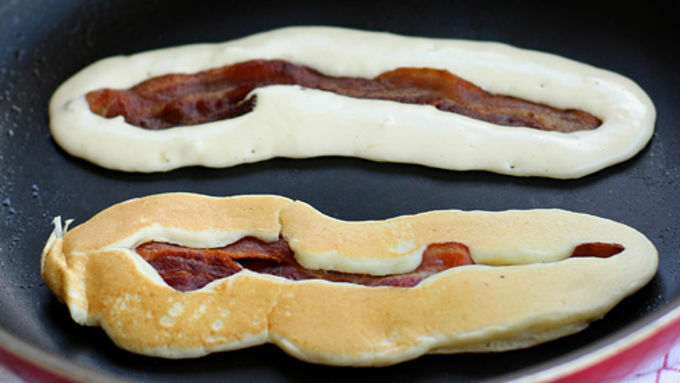 Pour pancake mix all around the bacon strip. Who says you can’t have your pancake and eat it too? And in this case, it’s a package deal with…bacon! 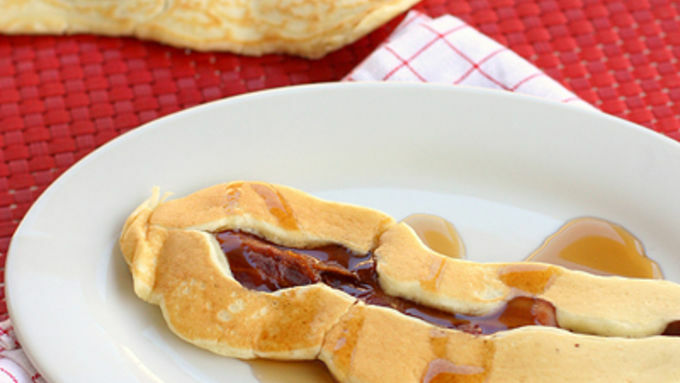 You can’t really have pancakes without bacon, so check out this all-in-one breakfast with the bacon cooked in the center of your pancake! Imagine crispy salty bacon surrounded by slightly sweet pancake batter and cooked up golden brown. 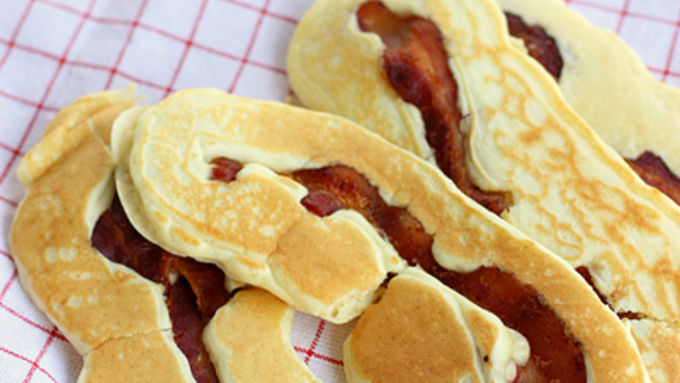 These Bacon Pancakes are exactly that! It’s easiest to use a griddle to whip these babies out but I unfortunately don’t own one so I made do with a skillet. Just lay your cooked bacon in the pan and gently pour pancake batter around the outside of the bacon. You want to make sure you can still see the bacon strip because that’s the part that is so intriguing. Whenever I eat bacon I’m completely guilty of using it to mop up any leftover syrup on my plate from my pancakes. So the obvious topping for these Bacon Pancakes was a heavy drizzle of syrup. This is a sensory party in the mouth appealing to both the savory and sweet senses at the same time. The taste buds go crazy for this combination. 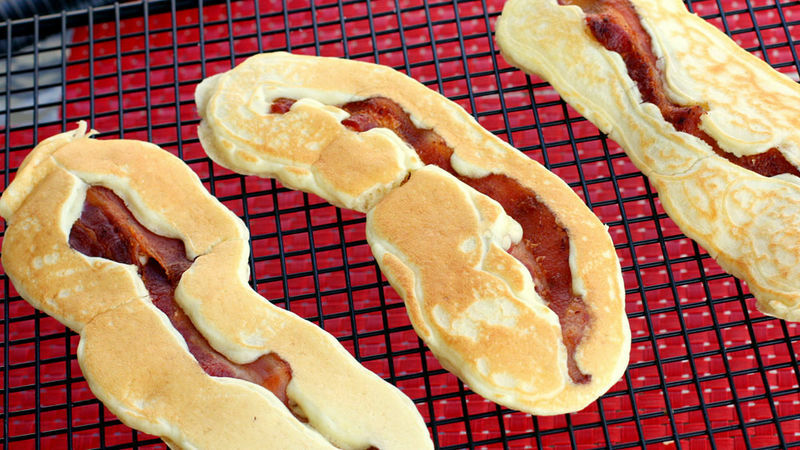 These Bacon Pancakes will be flying off your breakfast table this weekend!